Building an emergency fund is one of the prime requirement of the financial planning. An unexpected job layoff, a sudden critical illness or disability due to an accident are few examples of emergency situations where you badly need money. To some extent, you can use your credit card to address the emergency. But a credit card is not to be seen as a replacement of setting up an emergency fund. You have to keep at least six months of expense aside as an emergency fund. The size of fund varies from individual to individual. Suppose you have medical insurance that provides cashless benefits you can avoid emergency fund for a medical emergency. Similarly, if you have other earning family members who can take care of household expense in the emergency, you can avoid building an emergency fund. I strongly recommend building contingency fund so that you can handle any adverse financial situation and you need not take debt such as personal loan or loan from relatives. 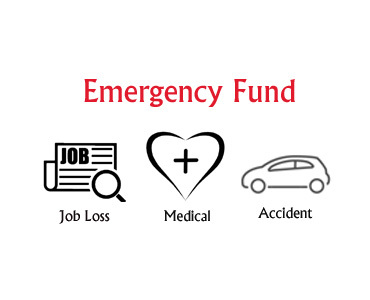 If you are ready to build an emergency fund and looking for options to stack your cash which can be easily accessible here are 5 Investment Options for Emergency Fund. You should not stick to one investment option. You should divide your fund and park at multiple places which are accessible easily. Please note that while building an emergency fund returns are not important. Accessibility of fund at short notice or 24×7 is important. Keeping money in saving account is foolishness as it offers only 4% return. However, for the emergency fund, you can keep park at least 20% of the emergency fund in a saving bank account. As you can access saving bank account fund 24×7 using a debit card. But please note that daily cash withdrawal limit is most of the cases is Rs.40000. If 4% interest rate is not acceptable, you can open saving bank account in the bank which offers higher interest rate such as Kotak Saving Bank Account. Another best investment option for the emergency fund is an auto sweep in account. Auto sweep in account convert excess of a fund in a fixed deposit which earns better interest rate 6 to 7%. However, accessing auto sweep account in the emergency is not an easy job. If you don’t want to take the hassle of opening auto sweep account you can opt for a fixed deposit account. Fixed deposit offers nearly equivalent returns compared to auto sweep account. You can break fixed deposit at very short notice. However, you need to visit a bank to break fixed deposit. Short Term Debt Funds are superior compared to bank FDs in terms of returns. Best performing debt fund can give return up to 8-10%. You can plan to invest in short term debt fund for emergency fund. Exit load is applicable for debt fund. Redemption of unit take time up to 2-3 days. Another investment option for an emergency fund is liquid or short-term debt fund. A liquid fund offers slightly higher return compared to saving the bank and comes without lock-in period. There are many fund house (Example – Reliance anytime money) that offers ATM card. You can use ATM card to withdraw money anytime. Please note that withdrawal limit is Rs.50000 or 50% of the balance whichever is lower. Apart from above 5 best investment options, you can invest your money in PPF and EPF. PPF allows closure of account after 5 years to address medical emergency or higher education. Similarly, you can withdraw money from EPF for the specific purpose. The time required for withdrawal of fund from EPF and PPF is high. Conclusion – You should establish the emergency fund by investing your money in various investment options mentioned above. Please consider your household expense, EMI, insurance premium, and other expenses while deciding fund amount. Don’t forget to review your emergency fund at least once in a year. Hi. Good options. What about exit load of Liquid or short Term Debt Funds. Exit Load is not applicable to most of liquid mutual funds.